Summary: Children respond when they are treated with respect, involved in the problem solving, and assumed to be well intentioned. I first heard of Alfie Kohn several years ago when Marshall Rosenberg, author of Nonviolent Communication, recommended Kohn’s book Punished By Rewards: The Trouble With Gold Stars, Incentive Plans, A’s, Praise, and Other Bribes. As I began reading Punished By Rewards, I was surprised to learn that study after study confirmed that rewarding students for good performance resulted in less creativity and reduced intrinsic motivation. This initially seemed contrary to what I learned as a college student majoring in psychology in the 1970’s, where I participated in experiments using rewards to shape the behavior of mice. Behaviorist psychology tells us that rewarding behavior increases it’s occurrence, and punishing behavior decreases it’s occurrence. More ‘good’ behavior is desirable. Isn’t it? The way we run our schools and prisons is based on a philosophy of rewards and punishment. What if there is a terrible flaw in this reasoning? What if using rewards and punishment to persuade people to act in certain ways produces either rebellious or temporarily compliant behavior, while eroding their commitment and their interest in moral reasoning and values? For example, if we reward children for taking out the trash or getting good grades, their motivation for performing these tasks becomes to get the rewards. They learn to evaluate the value of behavior based on self-interest, and to consider their actions in terms of anticipated rewards and punishment. They don’t learn to reflect on how they feel and whether they enjoy or value the particular behavior. They don’t learn to ask about the impact of their actions on others. Instead of developing an inner moral reasoning and authority, they consider anticipated rewards and punishment as determined by an external judge or authority. How often have you heard of a teenager who says “Why should I? What’s in it for me?” when asked to take out the garbage or study for a test? He or she may not have learned to value contributing to others, or to value following his or her own internal guidance and interests. One study showed that high school valedictorians are good at doing school – but they are not necessarily the ones who will come up with creative and innovative solutions to real world problems later in their careers. If we learn, as Joseph Campbell says, to follow our bliss and do things because we enjoy them, we are more likely to be creative and successful than if we do things because we anticipate a reward. But don’t we need punishment and rewards to teach children appropriate behaviors and values? Alfie Kohn explains the tremendous cost of using rewards and punishment to control children’s behavior. Even discipline techniques such as time-outs and withdrawal of attention can have serious repercussions. When we employ conditional love techniques, and tell the child they need to earn our approval, the child is more likely to learn about the use of force and power to control others and get what they want than they are to learn respect and positive values. 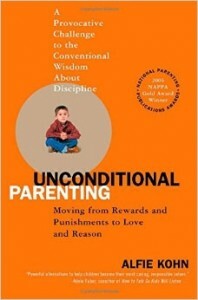 Kohn is not recommending new behavior focused techniques, but rather a new paradigm for parent-child relationships based on love and reasoning. This is not an easy or short-term approach. He suggests we change the goal from winning battles with our children to avoiding them. Getting the child to do what we want, without considering their motivation, sets up an adversarial relationship. They are more likely to be temporarily compliant or to act out. Instead, children respond when they are treated with respect, involved in the problem solving, and assumed to be well intentioned. What are some examples of using love and reasoning rather than rewards and punishment to engage with our children? How can we minimize messages of conditional acceptance and send more messages of unconditional acceptance? Consider refraining from giving praise. Praise draws attention to our reaction. Focus instead on their experience and evaluation. Instead of praising the child for sharing toys, ask “What made you decide to share when you didn’t have to?” It’s not necessary to evaluate kids in order to encourage them. Encourage them with your attention and interest. Next – It’s important for kids to feel trusted and accepted, especially when they are acting out. Communicating unconditional acceptance, without a threat to punish, allows the motive for the behavior to surface. We often assume we know their motives. For example, we may assume they are testing us, and therefore deserve to be punished. What if we assume they have valid needs underlying their behavior, and we involve them in problem solving so that outcomes are more likely to work well for everyone? Kohn suggests we look for opportunities to work things out together, rather than either giving in or imposing our will. And when they’ve done something that has negatively impacted others, Kohn suggests we give them space and support to figure out how to make things right. Some other suggestions include: Never give presents as incentives – give them unconditionally. Limit time-outs, and when you do use them, do your best to see that they are not perceived as punishments. Limit criticism. When giving feedback, focus on reasons and values rather than on behaviors. Look for opportunities to offer them choice. Even babies have preferences – look for ways to respect their choices. Everyone needs to know their voice matters.